With over 10,000 views during the hour and the following day, September’s #trusteehour was a collaboration with 2050 Climate Group, a charity whose board members are all under the age of 35. They shaped the #trusteehour conversations around young trustees and how to encourage more boards to consider appointing a young trustee. 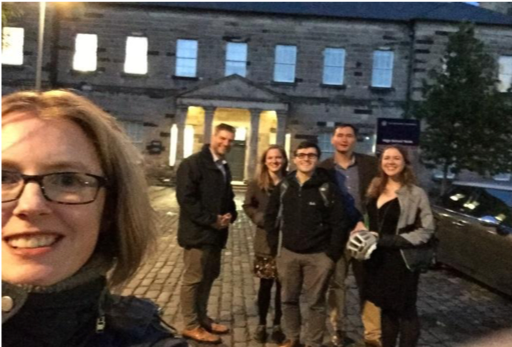 This blog is a guest contribution by Catriona Patterson (Chair of 2050 Climate Group), with thanks also to the Edinburgh Centre for Carbon Innovation for hosting us. 2050 Climate Group is a youth-led charity which seeks to engage, educate and empower Scotland’s young people to take action on climate change. We have 15 board members, over 40 operational volunteers, 2 paid interns and 1 member of staff, all of whom are young people: everyone in our organisation is aged between 18 and 35 years. We explicitly work to empower young people to take leadership roles, so recruiting, facilitating and celebrating young board members is both a demonstration of our ethos and impact, as well as the future we want to see. I became a trustee at the age of 25, and being a young person and a trustee gives me the opportunity to advocate for an organisation I’m extremely passionate about, whilst simultaneously enabling me to develop strategic planning and partnership skills – in turn compounding how effective I can be in my ‘day job’ (also in the third sector) and as a member of society. 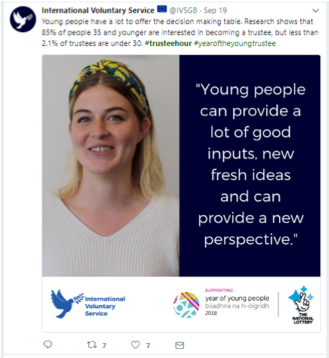 Pulling from our #TrusteeHour discussion, here are a few summary thoughts and tips for those interested in young trusteeship, considering recruiting young trustees, or sceptical about the whole concept! Boards have a responsibility to be diverse, and a range of ages and experiences is essential. Diversity of participation at board level perforates throughout an organisation: increasing the acknowledgement and inclusion of key stakeholders often unheard in strategic discussions. This is particularly pertinent when an organisation works with or for young people, or seeks to have an impact on our shared future: inter- and intra- generational stakeholders must be included in the decision making process. Young people can be perceived as having less to offer than older and more professionally experienced trustees, but this isn’t the case. Consider the new ideas, skills and networks that a young trustee can bring to a board – including their enthusiasm, energy and a new perspective. They might not have 25+ years of experience in a particular profession, but they are able to bring authentic knowledge of youth interests and behaviours that can benefit an organisation. It’s not just about understanding social media (although they may have suggestions as to how to increase your reach with such communication tools): they also have a major motivation to be thinking on a long-term strategic timescale. The barriers to young people becoming trustees are surmountable. Sometimes early-career professionals do not have the flexibility of schedule that retired or professionally established trustees have. Consider changing the time of your board meetings, providing letters of support to trustees workplaces, and support their attendance at meetings though reimbursing travel or childcare expenses. If we are to equip our charities with well-informed, skilled and experienced trustees, we must value that it may require some individual development – potentially initiated or supported by existing trustees, or through sector-support organisations, recommended reading, etc. Developing these skills as part of a board also spreads this knowledge across society – building a generation of knowledgeable and capable young people. Different leadership styles and skills bring different opportunities and strategic direction to an organisation. But often leadership is represented by the idea of a single individual taking charge and making decisions, yet empowering young people to lead can bring new ways of working, distributed leadership and more democratic processes to an organisation. In 2018, ‘young people’ is a hot topic, with the national themed year focused on celebrating Scotland’s youth. Many events and initiatives have raised the profile of youth participation, and many organisations have hosted youth engagement projects (such as shadowing, hosting, internships) to increase inclusion and participation. However, there is a risk that with the end of the themed year, comes the end of this enthusiasm for working with young people. Instead, we should see this year as ‘proof of concept’: a demonstration of the benefits of highlighting youth contributions, and a starting point for involvement going forward. Young Trustee opportunities are out there: including with 2050 Climate Group! The Charity Commission in England and Wales research notes that 71% of trustees are recruited through an informal process, which could be omitting young people from the recruitment pool. Advertising openly and widely is key to develop the internal and external message that young people are welcome and desired in board governance. The International Voluntary Service (IVS) is aiming to get organisations to commit to offering young trusteeships, Changing the Chemistry works year-round to increase board diversity, and organisations like the Scottish Council for Voluntary Organisations (SCVO) recently advertised for a youth board member. At 2050 Climate Group, we are also actively recruiting for three new trustees (18-35 years) in the areas of Law, Fundraising and Leadership. Know any brilliant young people who should join our board? Let them know! Details and application are available on www.2050.scot/news and we’re always welcome to have informal conversations with interested individuals considering applying. Excellent post! Thank you very much for the mention 🙂 We thoroughly enjoyed the discussion and connecting with you.